This whole affair reveals the absurdity of the whole mode of thought that undergirds the ‘gun control’ viewpoint. To tell you the truth, Sadiq Khan has probably single-handedly unraveled the entire propaganda victory of the David Hogg crowd; if we see a resurgence of support for the second amendment, we can lay it at the feet of Khan, who has merely extended “March for our Lives” logic to its inevitable conclusion. I wanted to touch on just one component of this affair. It is not the purpose of this post to rebut this lame argument, although I would take great pleasure in doing so. Some other day, perhaps. 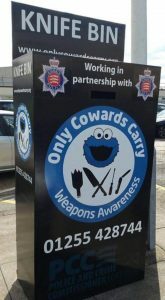 The purpose of this post is to call attention to the fact that in London, they were perfectly happy to ‘ban knives’ (overtly, not coyly) even though is patently obvious that knives have uses other than killing people. Now, the mayor said, “there is never a reason to carry a knife”, making him leading competitor for “Dumbest Person on the Planet.” Presumably (! ), even the emasculated British people recognizes that there are a myriad number of reasons for carrying a knife besides stabbing one’s fellow man. (A man can dream.) And yet, despite there being ‘other reasons,’ this did not stop them from banning knives. While I did see some language here and there to the effect that they were targeting ‘knives designed only to kill people’ (lol, no really), the proof, as they say, is in the pudding. In the pic of one of the ‘surrender bins’ you can see here, you can plainly see on the far right a measly pocket knife, Swiss Army-style, perhaps, and next to it, a screwdriver! (they’re killing me, lol), and then next to that a regular steak knife (I think), and what looks like a cleaver. To the far left is the silhouette of baby Groot. The horror. Again, presumably 99.99% of my readers will have at least 2 brain cells to rub together and will know, without me listing them, all the different ways these things not only have uses other than killing, but how they are not specifically designed to kill people at all. And yet they fall within the scope of the War on Knives. So, the bottom line here is that this whole idea that guns are singled out for special treatment because they only have ‘one purpose’ is pure horse-excrement. It is doubtful anyone who makes that argument really believes it. It is more likely they’re willing to say anything, hoping for the tiniest window of opportunity to win consideration of their ‘common sense’ gun laws. As I said, in a later post, I might give a more robust thrashing to this line of argument. What we need to understand from this development in London (and England more generally, since it appears the sentiment is common there), is that ‘alternate utility’ is utterly, 100%, completely irrelevant to them. Listen to me: they don’t care ONE LICK about the number of other uses for an item might be. That’s not actually what is motivating them to do what they do, nor does it inform what they choose to ban (although it is revealing what they choose NOT to ban, but that’s for a different post). Read my lips: they only care about the ‘alternate utility’ argument as a wedge argument to get YOU to compromise. If it was up to them, every citizen of every country of the world would be completely disarmed. (That’s not to say that they are opposed to weapons–governments can have all they want!) If you needed any evidence that this was the case, the London ‘knife ban’ gives you all you need. This is not (necessarily) a nefarious goal on their part. Their error is even more fundamental than all of this. The reason why they focus on instruments is that they cannot admit the truth of human nature, effectively summarized in the Christian doctrine of ‘original sin.’ But this is no mere ‘doctrine.’ Its an observable part of real life. But its one of those truths which has implications which are more intolerable than the truth itself. So they focus on guns. And knives. And any other absurd thing that might be next on the list. This makes them very dangerous. Not only because of their easy tendency to restrict the liberties of their fellow man, but because failing to recognize the capacity of evil that each human has sets them–and us–up for calamity.